Inspector Singh is back, but this time on secondment to Bali. A bomb has exploded and Singh has been sent to help with anti-terrorism efforts. But there's a slight problem: he knows squat about hunting terrorists. He's much better suited to solving murder! Would you try another book from Shamini Flint and/or Jonathan Keeble? Keeble has a great standard voice but his accents are beyond awful. His Australian accent went from South African to New Zealand and astonishingly to Cockney for a few seconds. His female voices, particularly Asian females are uniformly bad. He should just use his normal voice with slight intonation changes. Someone needs to point out that he is unable to do accents. You are basically cringing everytime he steps out of his normal reading voice. Who would you have cast as narrator instead of Jonathan Keeble? anyone. Or Keeble himself if he didn't do the corny accents. Would you listen to A Bali Conspiracy Most Foul again? Why? 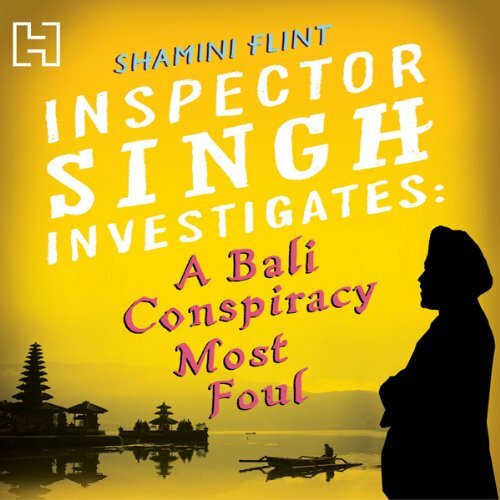 I rarely listen to a story twice, but A Bali Conspiracy Most Foul is well narrated with funny and believable dialogue that keeps you listening to the find out what will happen next. I definitely wanted to know how the story would end, but it was the story itself, the location and the culture of Bali described that kept me intrigued. Inspector Singh of course! He is someone I'd love to meet! It is too long to listen in one sitting, but I never wanted to stay away for long. I enjoyed the entire Inspector Singh series, 1, 2 and 3. This title was not my favorite, as I felt it was a bit trite about Muslim bombers and the role of women in a Muslim society, but I still enjoyed the mystery and how it played out. I found this to be a well-written and enjoyable book, and I find Jonathan Keeble, for the most part, to be an excellent narrator. Except for his Australian accents. If not for that, I would have rated it four stars. Don't get me wrong, other accents the narrator does are good, and I very much like Jonathan Keeble so I hate to be critical of him. But the Aussie accents are beyond dreadful - for one thing they wander in and out of Australian accents through Liverpuddlian and South African, but the insistance that all sentences be shrill and end with a determined upward inflection renders serious dialogue comical, and makes the characters sound shallow and flippant. I know we do tend to have an upward inflection, but I assure you we can manage to leave it off truly serious matters, like death! Not all Australians sound like Paul Hogan or Dame Edna. Otherwise, an excellent book, dealing sensitively with the many issues brought up by the Bali bombings, read by a superior narrator.